YBA YM501 review | What Hi-Fi? That's right, this is an £800 DVD player. If ever there was a product that won't be for everyone, this is it. If you're looking for the best available picture performance, then head to the Blu-ray players section of the website. And if you can't square this player's lack of 1080p upscaling and DTS decoding, then look away now. Still with us? Good. For this machine has an ace up its sleeve. 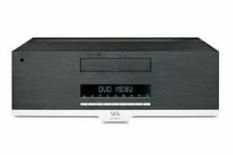 This player is from French hi-fi specialist YBA's Design range. It may have a Reliant Robin style design – with a central foot underneath the front of the unit – but you needn't worry about anything falling off. The chassis is rock solid but still cuts a smart profile, while the heavyweight remote feels suitably intruder-threatening in the hand, even if the button placement is a little confused and the GUI rather archaic. We're dealing with 720p/1080i upscaling only via the HDMI output, yet the YBA delivers informative, colourful and crisp images. There's a slight loss of grip at times with fast motion, but otherwise it's a level of DVD performance not far off the best around at this money. However, it's sonically that the YBA really stirs. Dolby Digital soundtracks have insight, scale and speed, if not quite the weight and punch of the class-leading Denon BD transport; but it's two-channel audio that allows the YM501 to puts its foot atop the aforementioned deck and reach for its smug face. The freshly remastered debut from The Stone Roses has real pace and space, plus impressive insight and genuine musicality. Multichannel analogue outputs are present and correct, though there's no support for SACD and DVD-Audio. Regardless it's in a different league to similarly priced players. If you only have the space or inclination for one disc player and you demand a level of musical performance that's rarely seen in cinema equipment, the YBA YM501 could just be for you.